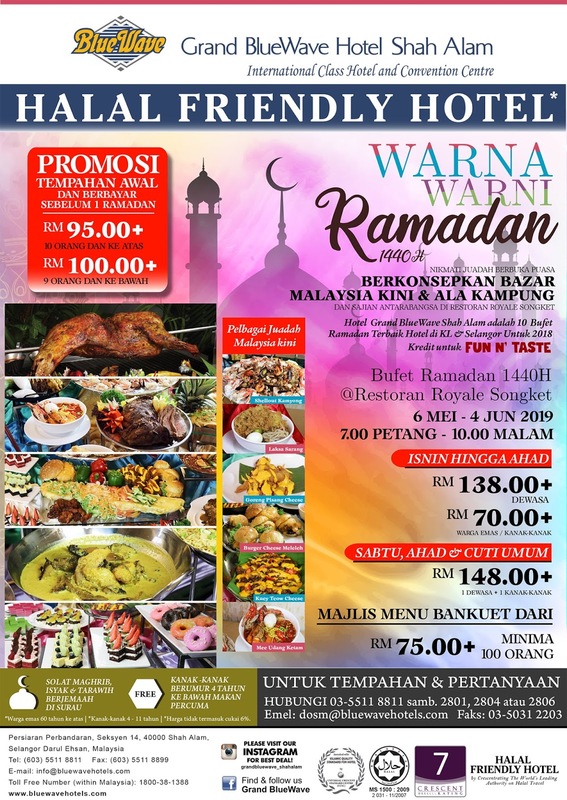 As Ramadan approaches this year, Grand Bluewave Hotel Shah Alam (GBWHSA) invites all guests to iftar at the colourful themed Ramadan Buffet, namely Warna Warni Ramadan 1440H. With the concept of ‘Bazar Malaysia Kini’, and ‘Ala Kampung’, the chefs have prepared varieties of Malay dishes menu as well as international selection menu. Guests can expect over 100 different varieties of menu selection at the extravagant iftar feast from local state dishes, main course dishes such as nasi pakistan, nasi putih, nasi kabuli, daging tetel asam pedas, sambal tempe berlada with jering, sweet sour fish, daging salai, roast chicken, baked pasta, pizza hawaian, lamb stew and a lot more. Individual bazaar concept stalls will be spaced around the hotel lobby featuring several theme such as briyani corner, Indian corner, Tandoori station, Chinese station, Malaysian Warong Favourite, Italian station, carving & grill station and Cita Rasa Negeri. 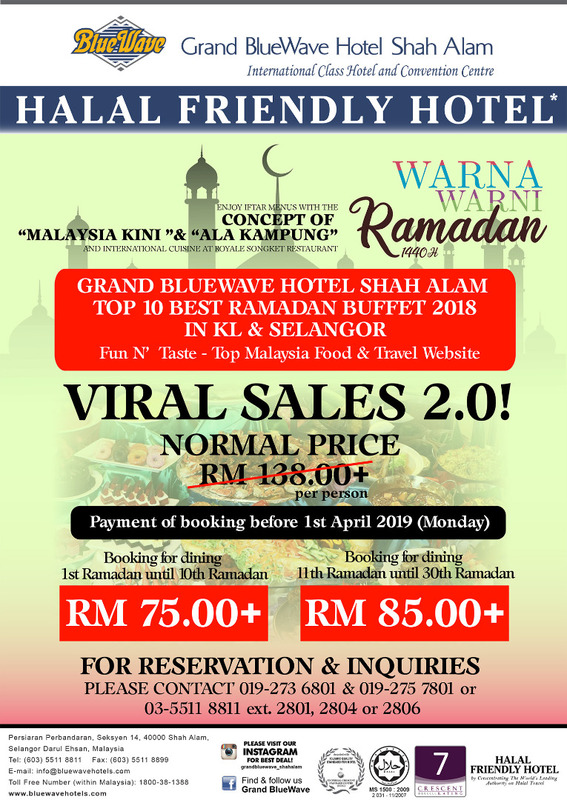 Following the social media hype, the highlight of the spread is the ‘Viral’ menus which are well-known in social media world such as Burger Cheese Meleleh, Char Kuey Teow Cheese, Shellout Kamyong Style, Spicy Fried Chicken Wing BlueWave with Cheese and Roti John Titiwangsa. from 6th May 2019 to 4th June 2019. Priced at RM138.00+ per person for adults and RM 70.00+ per children and senior citizen. Meanwhile, for Saturday, Sunday and Public Holiday, the price is RM148.00+ for 1 adult and 1 child. For more information and reservations, please cal the Sales & Marketing Department at 03-5511 8811 ext. 2801, 2804 or 2806 or directly email to dosm@bluewavehotels.com. Grand BlueWave Hotel Shah Alam (GBWHSA), a five star hotel located in Selangor, Malaysia has been granted the highest Halal Friendly Hotel Rating of 7 by Crescentrating. It is the first hotel to get the highest rating in Malaysia and the region.